To be honest, sometimes it doesn't matter all that much. Your cookies will be fine if they're a little to fat or a little too thin. But sometimes a specific thickness is more important, like when you're trying to make 3D cookies that are supposed to fit together. Or if you want every batch of cookies to be the same thickness. Not only is it hard to roll dough to a specific thickness, it's hard to roll it evenly from one edge to the other. And if you do decide to measure your dough, how do you do it? Do you measure the edge, or do you cut into the dough to check how thick the interior is? Do you cut a cookie, then check that measurement? With a lot of practice, you can probably eyeball that 1/4 inch thickness and get it close enough. Or you can do the sensible thing and cheat. Put training wheels on your rolling pin. 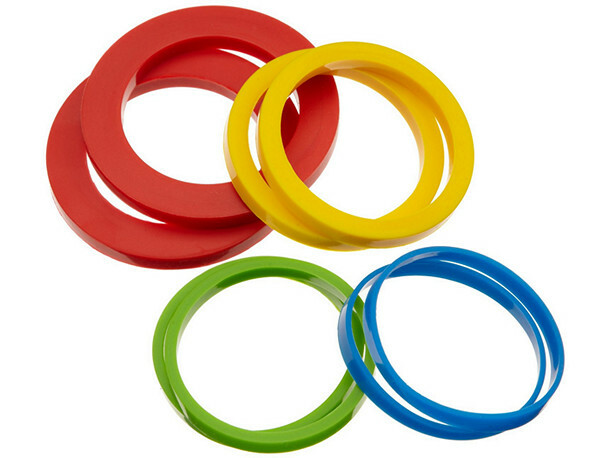 The Rolling Pin Spacer Bands ($6.99) from Casabella are a set of four pairs of silicone bands in 1/16-, 1/8-, 1/4-, and 1/2-inch thicknesses that you slide onto your rolling pin so you can't roll the dough any thinner than the bands. It's genius, really. Of course, if you really put your weight on your rolling, you can compress the spacers a little, but they're pretty dense, so you won't be able to compress them a lot. The bands fit standard (not French) rolling pins from about 2 1/4 inches in diameter to about 3 inches. They stretch to fit, and if they're a little loose on the pin it's fine. The downside of using these bands is that the dough can't be wider than the space between the bands or you'll start rolling trenches into the dough. The upside is that if you need the dough to be a specific width, you can set the bands at that width on your rolling pin, and keep the dough between the bands. When I was rolling pie dough that needed to be wider than my rolling pin, I used one band on one end of the rolling pin and did my best to keep the pin level. It wasn't absolutely perfect, but it was better than my usual lopsided freehanding. I found that the thinnest bands - the 1/16-inch - were pretty handy for flatbreads, because I tend to get carried away and roll them too thin. These kept them at a reasonable - and consistent - thickness. The bands are made from silicone and they're dishwasher safe, but they're easy enough to rinse clean if you prefer.